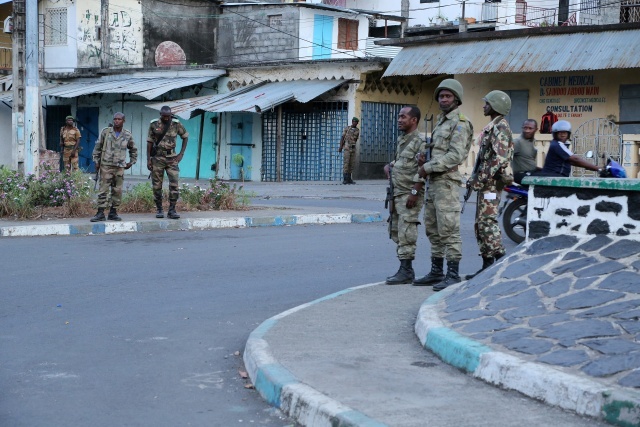 (AFP) - The Comoros military on Saturday regained control of Mutsamudu's old city centre on the island of Anjouan, a minister told AFP, after armed rebels staged an uprising earlier this week. Soldiers and rebels opposed to President Azali Assoumani had fought in the narrow lanes of the medina quarter in Mutsamudu since Monday, with at least three people killed. Tensions in Comoros, a coup-prone Indian Ocean archipelago, have mounted in recent months as Assoumani bids to extend term limits through constitutional changes that could see him rule for 11 more years. "The army has retaken the medina," Education Minister Mahamoud Salim Hafi, who has led the government response to the rebels, said as soldiers patrolled the streets. No fighting was reported during the day and there was no evidence of rebels being present. AFP reporters saw civilians emerge from their houses, some for the first time in six days. "It was difficult to eat, except with the help of neighbours... but most difficult was that we were deprived of water and electricity," Djamou Houkoum said. As soldiers passed in single file, Salma Mohamed Dossar opened her door. "Difficult days -- everyone fled. I refused to leave, they told me was crazy, but I will never give up my house," she said, smiling. Her neighbour Mrs. Salma Souloufou said: "Now that I can put my nose outside and feel the fresh air, it's happiness." One square was littered with debris of stones and tear gas grenades. A weapons' amnesty deal signed between the main opposition Juwa party and government on Friday appeared to have been rejected by the rebels, who were estimated to be about 40 strong. Assoumani won a widely-criticised referendum in July allowing him to scrap the rotation of the presidency between Comoros' three main islands, disadvantaging opposition-leaning Anjouan, which was next in line. The government had sent in reinforcements to quell the unrest in the old quarter of Mutsamudu after rebels erected barricades and repelled attempts by the security forces to regain control. Over the last six days, many civilians fled as a curfew was imposed and water and power supplies were cut. The president, who came to power in a military coup and was elected in 2016, has indicated that he plans to stage polls next year which would allow him to reset his term limits and theoretically rule until 2029. The Comoros islands -- Anjouan, Grande Comore and Moheli -- are located between Mozambique and Madagascar. They have endured years of grinding poverty and political turmoil, including about 20 coups or attempted coups, since independence from France in 1975. The last coups was in 1999 when Assoumani, then the head of the army, seized power for the first time. He gave up power in 2006 before being elected two years ago. The fourth Comoros island, Mayotte, remains French. Assoumani's government accuses the opposition Juwa party of being behind the unrest on Anjouan. Former president Ahmed Abdallah Sambi who leads Juwa, is from Anjouan. He has been under house arrest since May. Earlier this week, Interior Minister Mohamed Daoudou blamed "terrorists, as well as drug addicts and alcoholics" for the rebellion. The United Nations and African Union have called for restraint from all sides and for stalled talks between rival parties to resume.